A little about me. 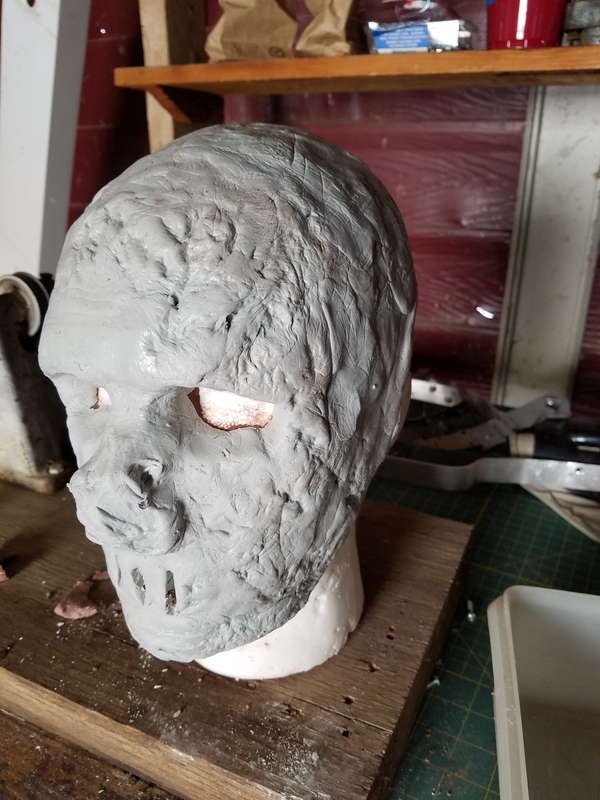 I've been making masks for roughly 24 hours, the epoxy clay finally arrived only a couple of days ago and I'm most likely the least talented among us, but I won't stop trying. 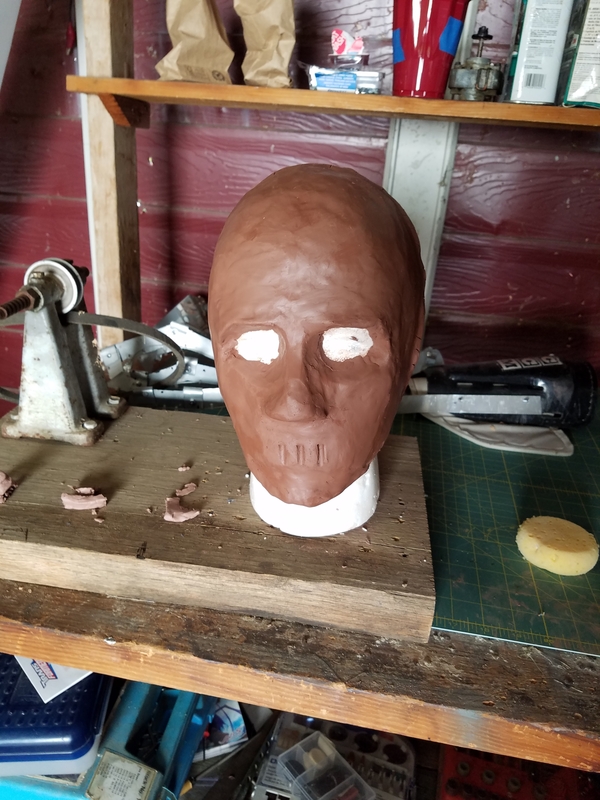 Making masks and props has been something that's interested me for a long time but I never knew where to start until I saw a post about Bruce D. Mitchel's mask making class. 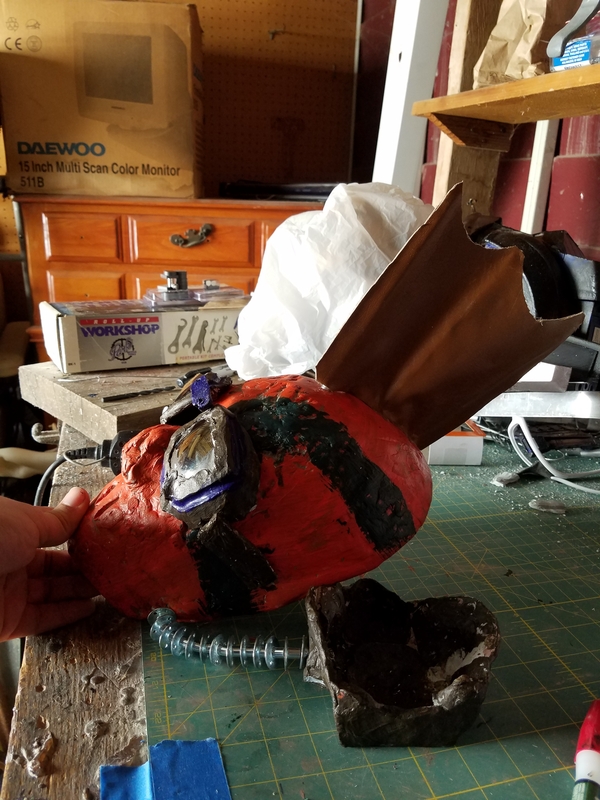 There are a few types of masks I want to learn to make the first one is monsters from video games, comics (violator from Spawn would be interesting to make.) 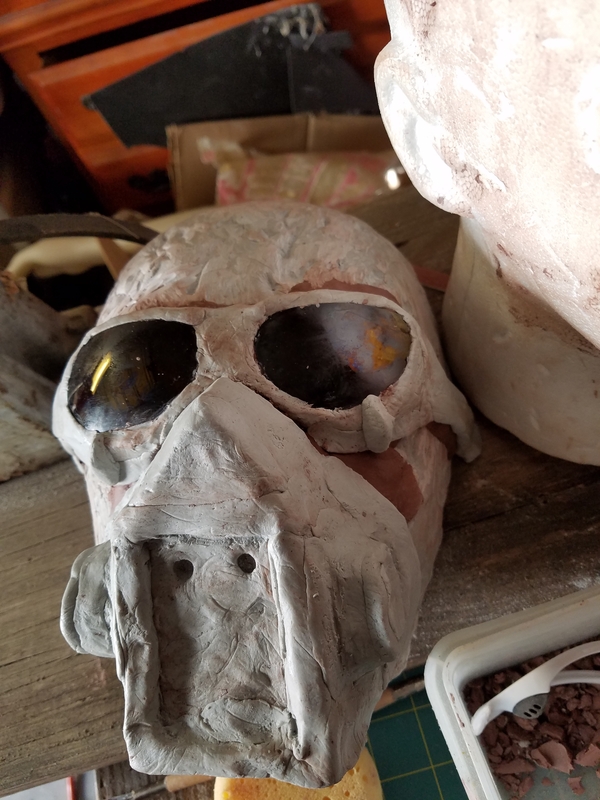 and wasteland survivor style masks. The base is potters clay since I already had it lying around. Seven dollars for wet dirt is quite the steal. I winged it. Did I mention that I winged it? There was no template, in my beginner mind I figured "bark skin!" So I rolled it against a tree and got a pig man, well I bashed it a few. One lens is higher than the other and the right side of the jaw is wider. 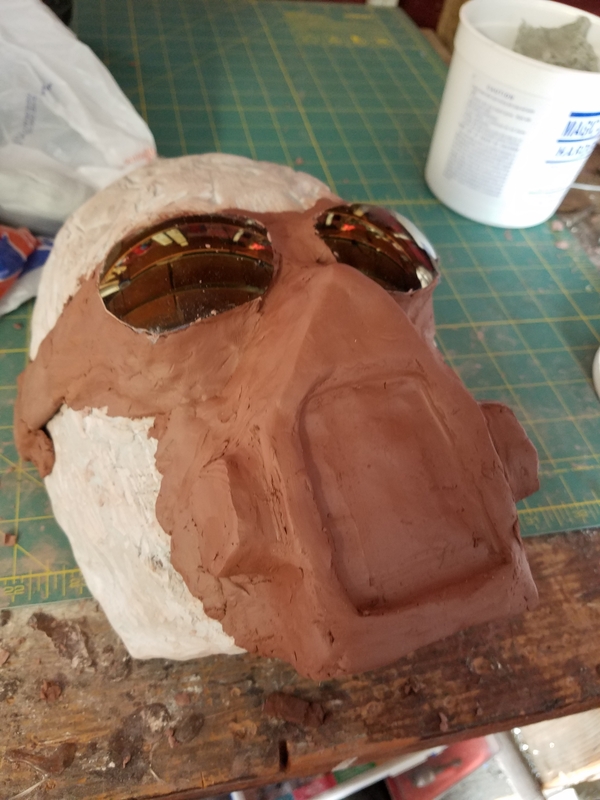 I really did sand it. 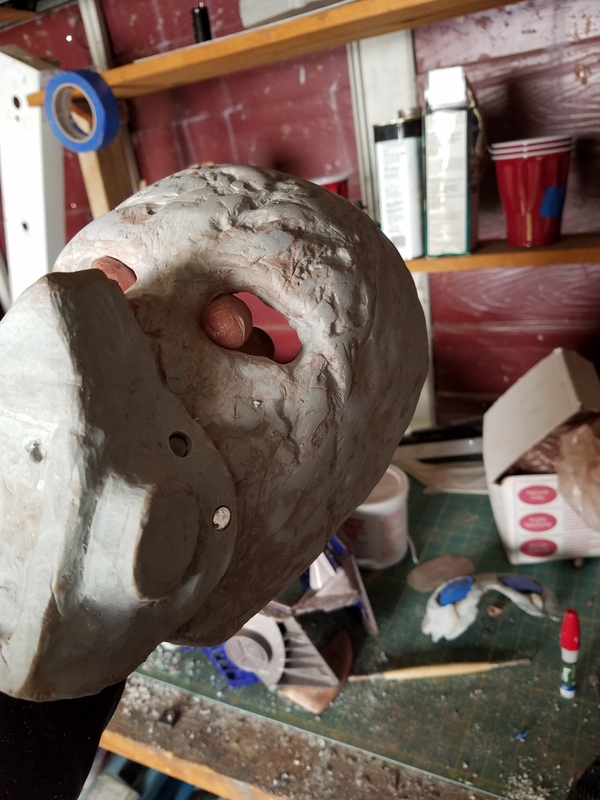 At this point the removable mask saves the original and I'll be holding it up with a magnet in the nose and one in the jaw, in theory it should work. What have I done. The flat box inside of a square didn't sit well so I added pizazz. 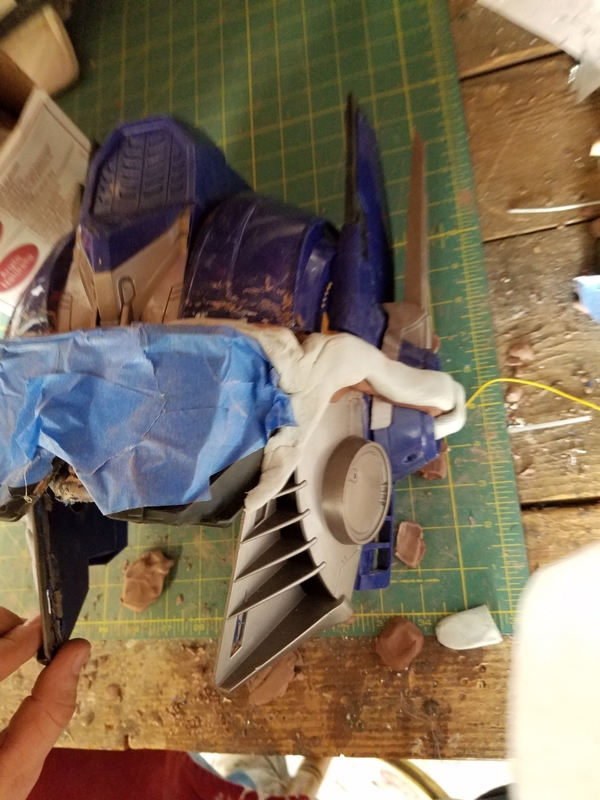 The whole thing was rush job and still needs to be painted or broken. Sanding will commence after Feb 25. 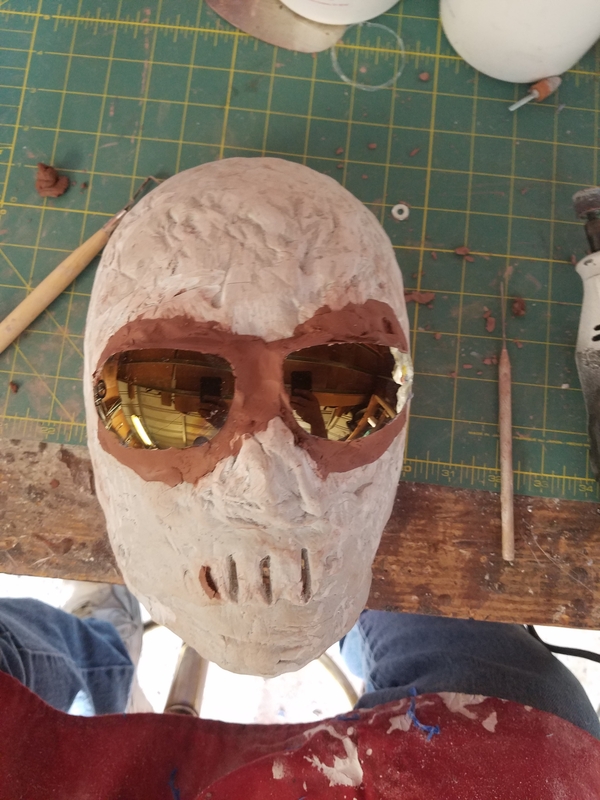 Another mask I'll be upgrading mainly for wasteland so i won't feel out of place with my friends. 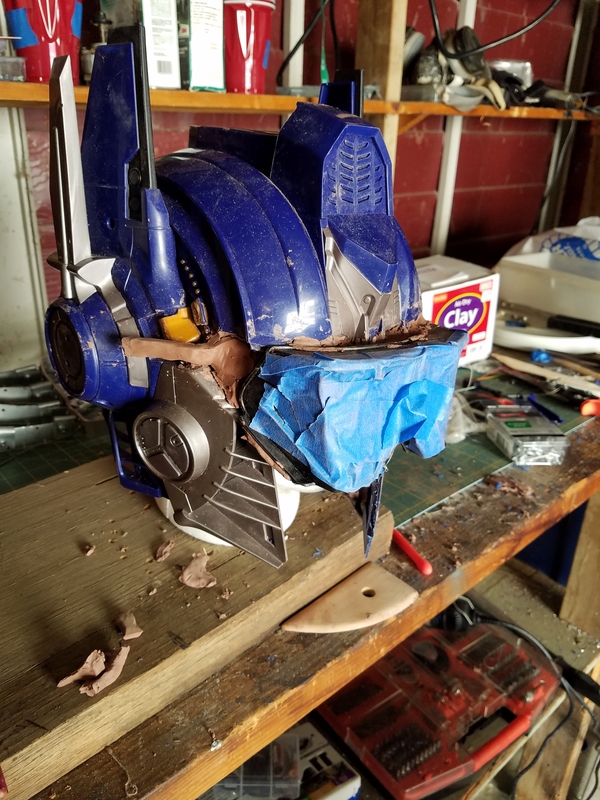 Ripped out the mouth bits and the goggles inside the mask itself look cool, without the blue tape. The goggles will be held up by springs attached to the ear things. 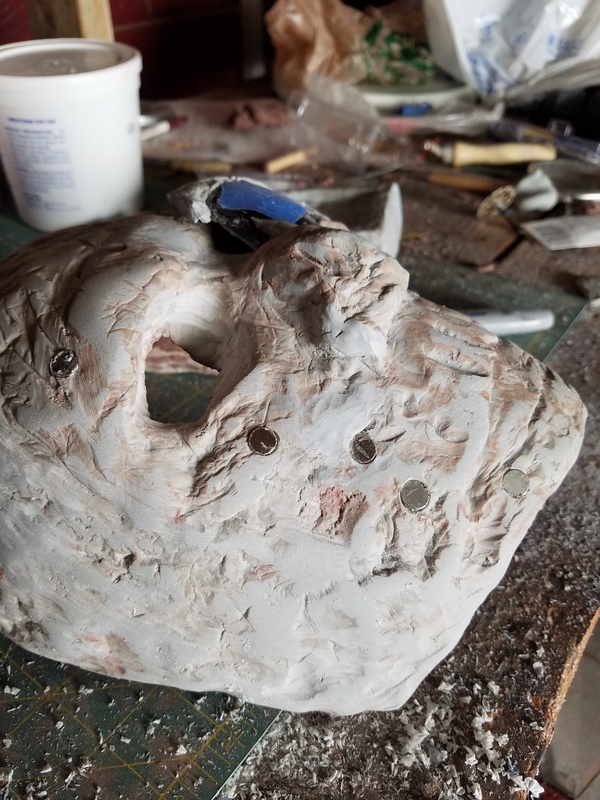 It comes with two holes already drilled as part of the mask. 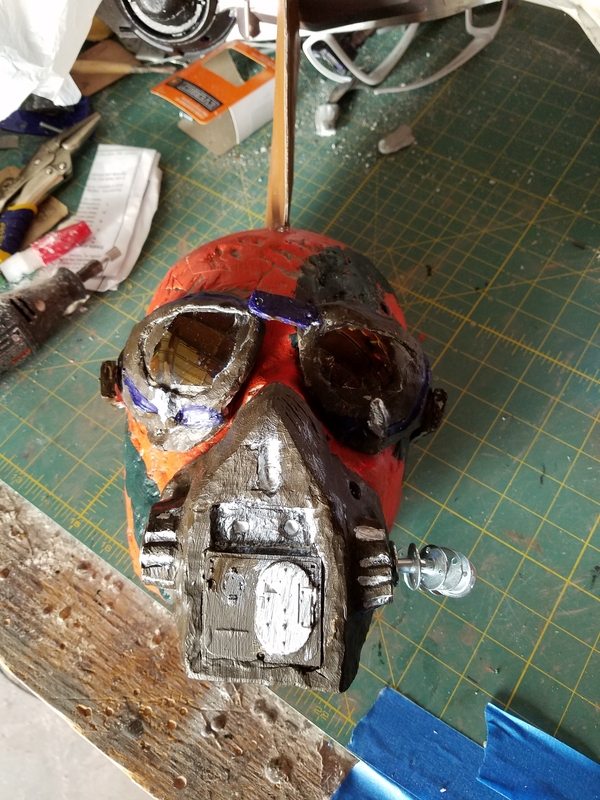 The second part of my homework was to drill holes and insert magnets and dremel surface details on the mask and goggles. I didn't get around to taking pictures of the detail work. Here I've placed one too many mouth magnets. Had to flip the magnets a few times. Here's another angle of the thing. 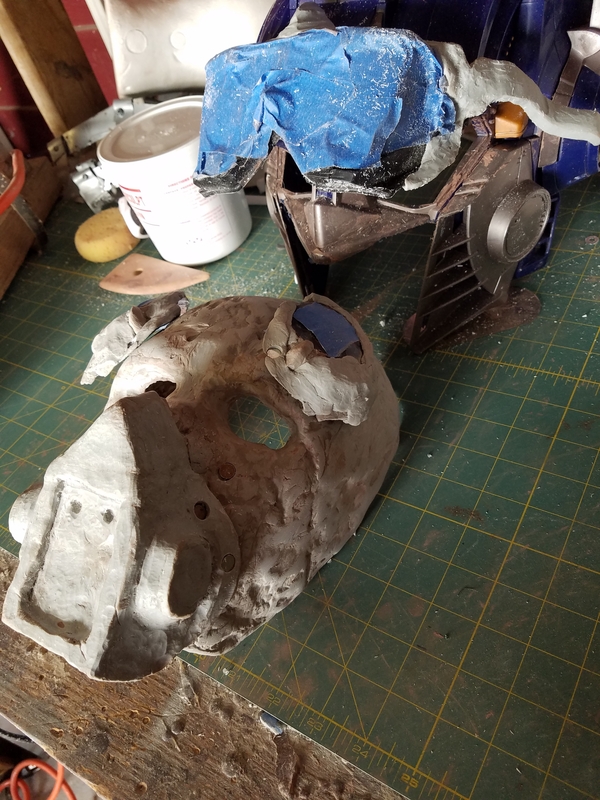 The magnets are all in place as well as the goggles for optimus. 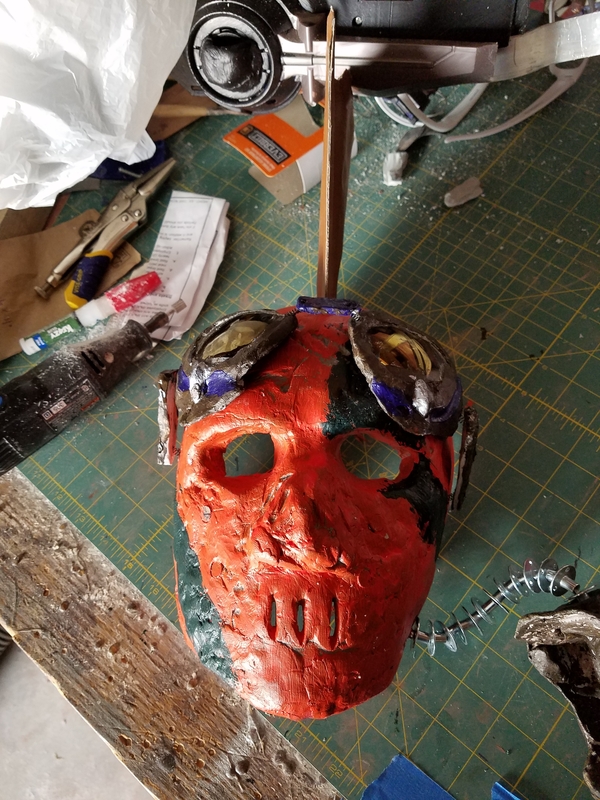 My homework was to emulate Bruce's mask with T-nuts and leather attachments. Jo annes doesn't carry leather but there was pleather. The hatch on the mouth piece is from the back of a bradley tank. I bought out all the t nuts from the hardware store and I used them all. Scavenged springs from an assorted set that's why the bridge seems off center, because the whole thing is. Here we have it with the pieces latched up and the mask off. 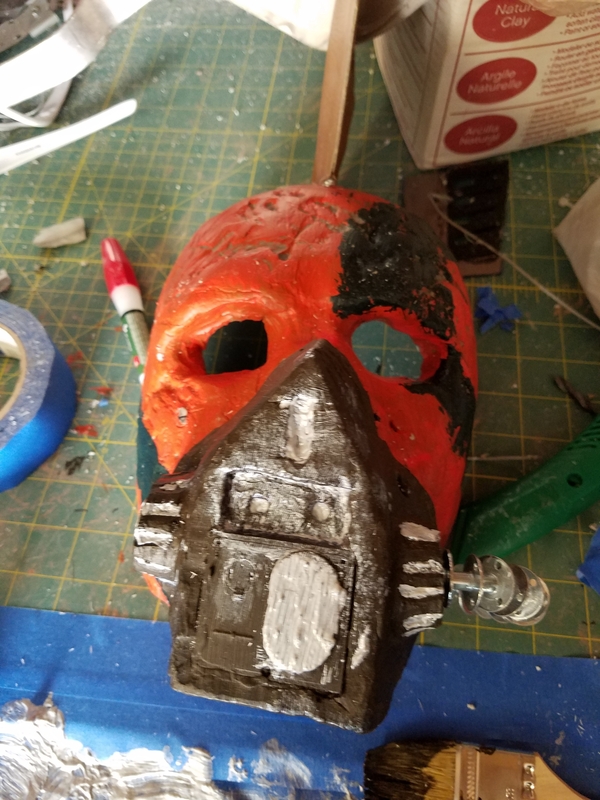 I used bicycle wire for the respirator and it's not capped so if I put the mask on my face will bleed. The side shot showing off the ridiculous faux leather fin held up with t-nads at the base and some kind of hobby sticks broken in half for the mast. probably drill breathe holes for the nose later, much later.